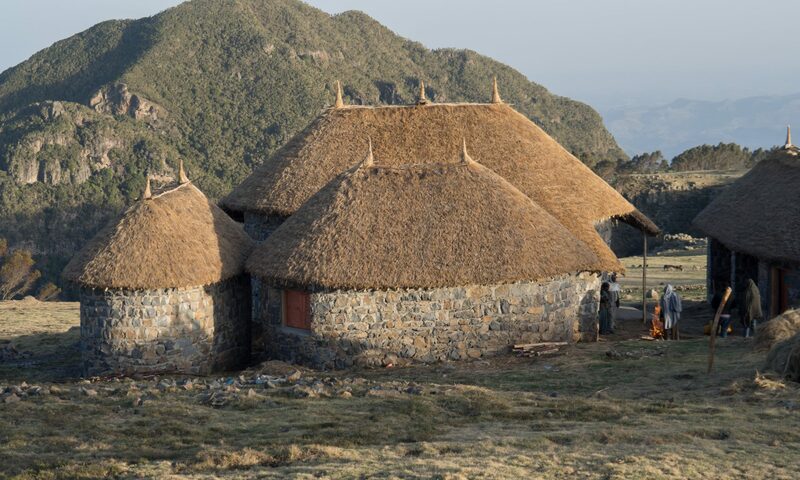 Goshu-Meda is the highest of our lodges at around 3200 metres above sea level. Set in a huge naturally formed bowl, with fields and sparse crops around on the edge of the escarpment. Goshu Meda means “Buffalo field” and although you will not see one, they are long extinct, you feel that anything might be possible. As you stand on the edge of the escarpment, looking into the largest section of unbroken Juniper forest in the Amhara regional you feel this is the place that Moses might have met the Lord. To reach Goshu Meda you will follow the main road towards Debra Sina before turning right (east) along a rough all weather road, that varies in quality depending on the time of year. The road reaches a school, from where a moderate walk for about an hour at altitude will bring you to the newly constructed lodges. The animal and bird life are rich. Short walks through stands of endangered species such as Giant lobelia are a unique experience. At Goshu Meda you will understand what Afro Alpine, means as you could be in the Alps. This is a good route to Mescha Lodge, located two or three hours away, after dropping over the escarpment, through giant heather into an area of, Juniper trees this feels like a glacial ‘col’ (but it’s not) at Wuti. The views from Wuti, north and south give unforgettable perspective of the escarpment.